My Sister forwards emails from this fellow occasionally, with pictures attached. 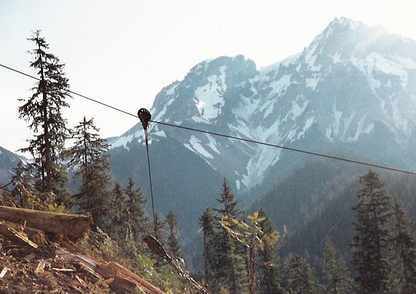 Some spectacular photos of mountains in the Northwest. I've seen some of them when I used to fly from Seattle to Anchorage! Someone could get lost in some of those mountains and never be found! Some great scenery there.....Wouldn't you hate a job that took you to places like that where you were forced to take photos and sell them to make a living . I grew up in Squamish where Mt Garibaldi and the Tantalus Range are visible from the valley.We logged right at the base of Mt Garibaldi in the early 90s. The mountains around Squamish are awesome. I've driven and hiked the mountains east and north of Seattle many times. If there was a place I could live it outside of here it would be in that area. Paul that is a beautiful shot, thank you also. Brakes?! Now that would take all the fun out of the ride! I've ridden with her in many different vehicles Marcel....not sure she even knows there's a brake pedal. Well, awsome pics. Given my wife is an ice climber and her maiden name is Tiedemann, guess we'll have to go try the "Tiedemann Group" looks like some great lines in all those pics. Recon indepth at your finger tips.